BOne of the places in East Tennessee that people enjoy in the fall is the Big South Fork National River and Recreation Area. This park is one of the more rural of the National Park system. Located in Kentucky and Tennessee, the park offers a multitude of recreation opportunities. Directions to the Big South Fork National Recreation Area are available online. Visitors can camp, go horseback riding, hunt, fish or go paddling. Astronomy and hiking are also popular activities. The area's brilliant fall foliage attracts many visitors annually. Three visitor centers welcome park guests. The proximity to the campground makes this center a popular location. It is roughly 15 miles from Oneida and about 24 miles east of Jamestown. There is a bookstore, vending machines and ice. Exhibits at the visitor center cover the many recreation activities at Big South Fork National River and Recreation Area. Visitors to this part of the park can enjoy a train exhibit and purchase tickets for the railroad excursion train. Inside the depot there is a bookstore and and additional exhibits. 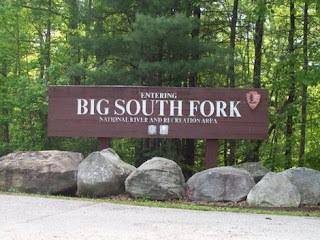 Any railroad fan would enjoy a trip to this portion of the Big South Fork National River and Recreation Area. This is an abandoned coal mining town. It is an outdoor museum that was reconstructed in the 1980s. Visitors can tour the town at any time to view the exhibits. More information about the community and other visitor centers is available from the National Park Service. Each site has its own charm to offer. There is no admission charge but some of the attractions may have a fee. Park hours and seasons are listed on the link above. My family had the privilege of visiting the Big South Fork River and Recreation area few months ago. We hope that yours will too. Looking for something to do in the fall? Check out this article on free stargazing and astronomy programs at Big South Fork.